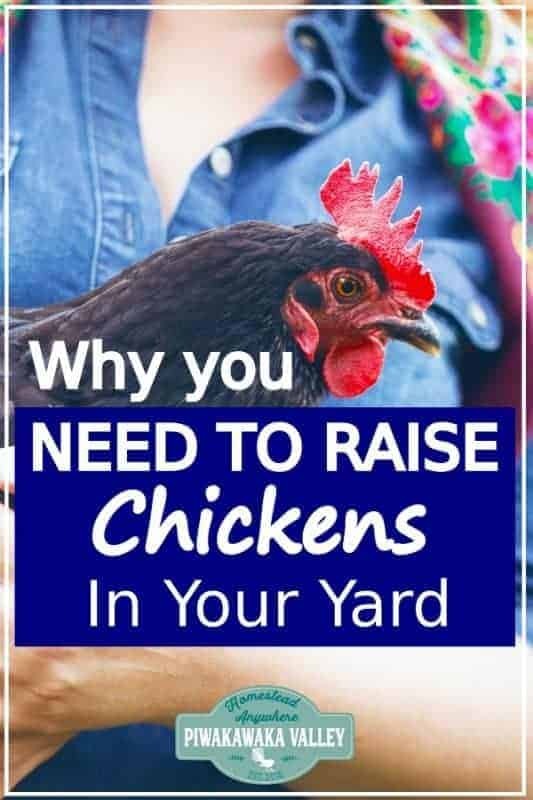 If you are looking to become more self sufficient or are simply looking for a new pet, I am here to tell you about the top 5 reasons why you should keep some chickens in your backyard. Owning chickens is great, they are an amazing addition to almost anyone’s yard and they are a gateway to all things self sustaining and self sufficient. 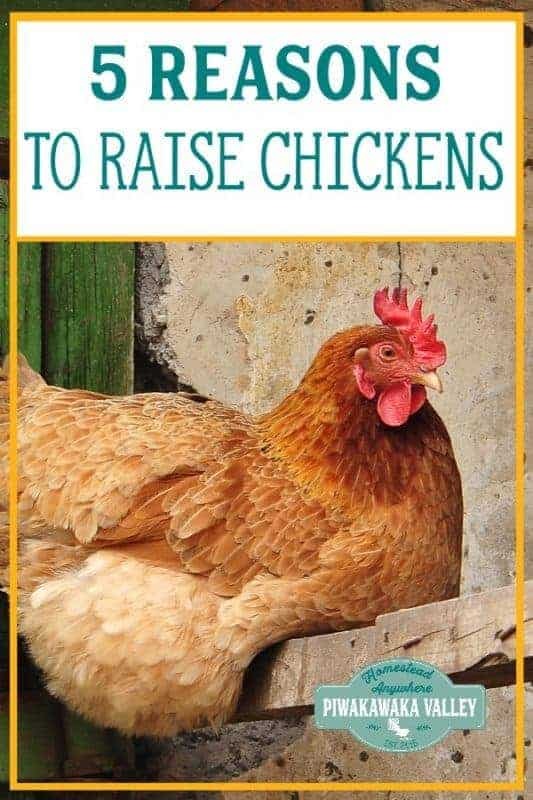 If you are starting to add some homesteading practices to your life even if you live in the city or urban setting, you should look at getting a few hens to keep as well. For people who already keep chickens, this needs no explaining, but for those on the fence about owning chickens, I hope that this helps to convince you to jump on in! Well, this is the obvious answer right? I mean who doesn’t love the idea of farm fresh, free range, nutritious eggs fresh each morning?! If you haven’t tried a real, fresh egg before, you should try it. They are quite different from the ‘free range’ eggs you get from the store. There is nothing quite like a real, fresh egg. The eggs you get from the store can be up to a month old BEFORE you even buy them! Additional eggs can be sold to help pay for feed, or given as a thoughtful gift. You don’t need a rooster to get eggs, and most breeds of chickens start laying at 4-5 months of age, and will continue until they are at least 2-4 years old. In a chicken coop, you need to allow 2-4 square feet (1/4 square meter) per bird inside and a run of about two to three times that size as well. Chickens take up very little space and while they are happier if you let them out to free range, if you cannot do this, they are happy if you take the food to them to dig and scratch in. When choosing, designing or building your coop, make sure it has adequate ventilation, protection from the elements, roosting bars, nesting boxes and an easy way for a full-grown adult to access all areas for daily feeding and cleaning. If you are looking for an animal that your children can learn to care for, look no further than the humble backyard hen. They come in a multitude of colours and varieties and when they are handled gently and tamed, they are very friendly little characters. Some chickens even love to be cuddled and petted. Chickens need the basics of food, water, protection from the elements and a couple of other chickens to hang out with. They will generally choose to lay in their nesting box and will learn to put themselves to bed at night after they are shown for a few nights where that is (not the neighbours plum tree!). Chickens need very little by the way of upkeep, they need no grooming, nail care or ongoing vaccinations. With a deep litter system you can leave them for months without cleaning them out – you do need to add fresh bedding though! 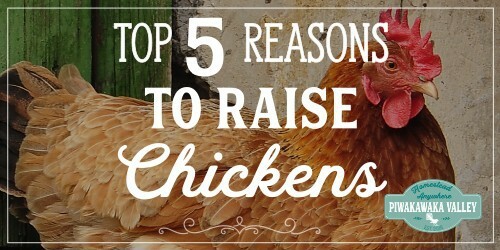 5 Owning chickens is cheap! If you have a shed, or can build a small run from recycled materials, a chicken coop will cost you very little, if any money. Feeding chickens doesn’t have to be expensive either. Back in the day every family kept some chickens in their backyard. Chickens would eat human food scraps, spent vegetables from the garden and weeds. They would range about and eat bugs, and many families would raise fly larvae for them, or these days you can buy them meal worms! All this food is free or VERY cheap to produce. Most families fed the hens very little commercial layers food or grain. After the world wars and depression was over, families stopped owning their own chickens and relied more and more on commercial egg production. The only way to economically produce huge volumes of eggs was to keep the hens inside and feed them specially formulated layer feed. The old-timey backyard chickens may not have laid every day, but they found plenty of nutrition and protein from the food scraps and bugs to lay most days. Commercial egg production birds have to lay everyday, and the moment they become less productive are the day they are ‘retired’ from the farm and replaced with the new, younger, fresher models. If you are keeping hybrid laying birds, like that which they raise at the egg farms, and you want an egg everyday from the hens, you need to also be feeding a well balanced laying bird food. If you have the space to raise your own chicken feed, ensure your chickens will be getting lots of protein and calcium from insects, plants and bugs, then you will need less, or no commercial feed. 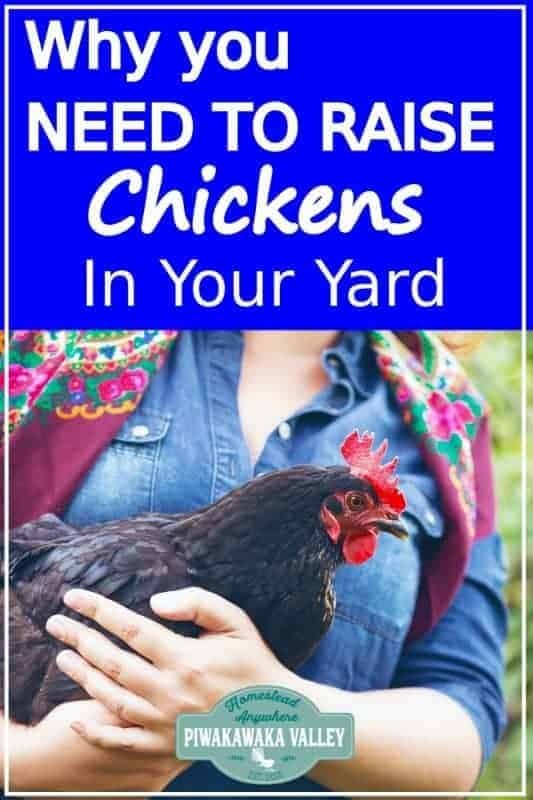 Keeping chickens is a great idea for many people, but as the rules vary so much from place to place, I do recommend checking with your city’s rules. In our city you can keep 6 chickens but no roosters in a backyard. Check with your local city ordinances before making a purchase. Some may have set standards on coop sizes and the maximum number of birds you can own. You will also have to make a decision about what you plan to do with your chickens when they are no longer laying eggs. Will you let them retire or will you continue the circle of life and cull them to make way for new stock. This is a personal decision, and one I cannot make for you. We have decided that we do not keep farm animals that are not producing, so we have a full flock turnover every 2-3 years.